Hủ tiếu my tho, a noodle soup consisting of rice noodles with pork stock and toppings, is made from dried Go Cat rice noodles. 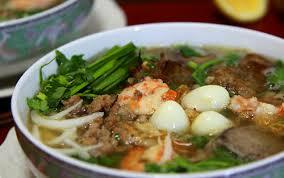 A specialty of Tien Giang province of Vietnam, this dish consists of rich ingredients like pork, pig heart, shrimp, minced pork, quail egg, crab meat. Being bean sprouts, shallot, sliced chili, lemon, soya sauce, this delicacy is selected as one of the top 100 dishes of Asia. Comments for HU TIEU MY THO are now closed.